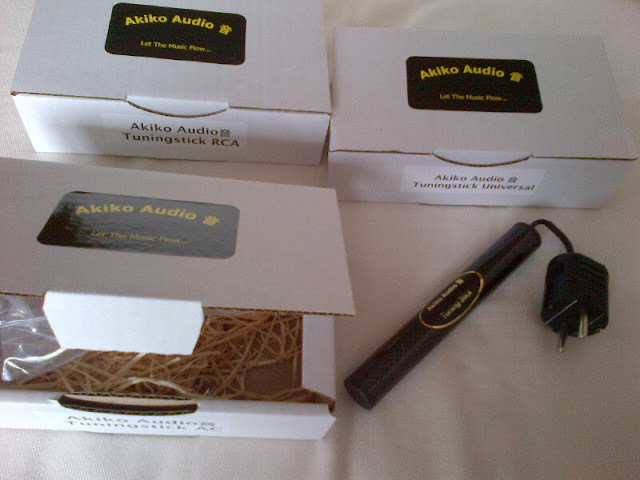 Family team of Marc and Sander Van Berlo forms a Dutch Akiko Audio, that offers some very interesting products. I've received quite a few review inquires from our readers and contacted the company for a review samples. Sander kindly responded and few days later package with three tuning sticks arrived at Mono & Stereo HQ's. When it comes to the high-end audio accessories there are immediate guarantee of passionate responses from the society. Many will jump in disbelieve, but those being long enough around will approach the non typical products with a broader mind. I did the same. I'm willing to try any new cable, accessory and other devices if they will bring the illusion of music closer to reality. I guess the restless geek in me always needs a dose of a thrill and refinement. Guilty of sweet addiction? Yes! Admit it or not we're living in the world of electrical and magnetic smog. Devices that surrounds us are emitting vast and almost non measurable amount of electrical hubrises. How does all these relate to our health is a material for a dedicated article, but it's for sure that all those subtle electrical and magnetic energies affects the us and things around in a certain way. Now when it comes to the high-end audio accessories the actual performance and result vary by length. Some of the affects are presentable at once, some only in late night listenings when everything calms down and with some you simply cannot hear or spot the difference. 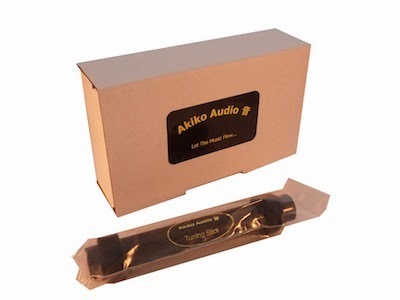 Akiko Audio Tuning Sticks were designed from ground up. They went into the radical structure of using the contemporary know how of dealing with crystal structure of materials and proudly manufacture everything domestically. First thing that you noticed with the Tuning sticks are their carbon fibre looks. This is an actual woven carbon that is already used by some manufacturers to a different degree in dealing with micro vibrations and resonances. Akiko Audio did't implement it only for looks, but as a integral key material, that acts jointly with other Tuning Sticks internal materials. The innards are secretively filled by black resin like material and combine few solutions in creating a products that basically work as a absorbing electromagnetic passive device. "The electronically amplified rendering of music is always cause for a certain increase in ‘noise’, especially when coming from a digital source. 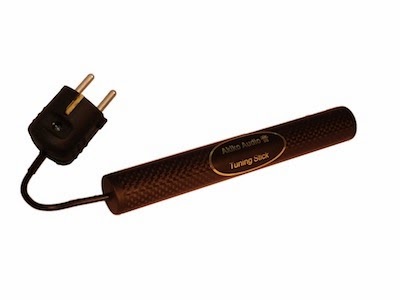 The Tuning Stick has been developed to lower this noise floor, so the music is experienced better. It may seem like magic, but applying selected materials does influence the sound (in the same way that choice of materials influences the sound of a speaker or cable). By combining different materials, we also combine their physical properties. Measuring the results then becomes a very complex task, but the fact that it works and is appreciated by many music lovers is a result we are extremely proud of." RCA Tuning Stick was first being taken under the scope and perhaps the most hard to critically test and review. With high-end audio accessories it's not always the most easiest thing to hear or spot the differences. Sometimes they are even non existing. RCA Tuning Stick took the most of my concentration and late night listening hours in capturing the clear notes, that could be later on forged into fluent text. The most evident performance feature I could highlight is a ground noise "effect". Not sure what exactly worked in a favour for that, but somehow the "beloved" blacker blacks were more upfront and noise ground level seems to be being taken under the control when connected to the free RCA slot on the backside of preamplifier. RCA Tuning Stick falls into the line of accessories for the final fine running, that might not be the easiest to spot the difference instantly, but will add on to the already established and well balanced system. With Universal Tuning Stick things went on almost too easy. This was an instant shower regardless the time of day or on the quality of electricity. Sticking in onto interconnects or speaker cables, the effect was like a punch in your face. Direct and with booming impact. I usually don't fetch for usual audiophile jargon, but here the easiest way to describe the affects of Universal Tuning Stick were deeper impact, wider soundstage, airer space around performers and instruments etc. I tried the Universal Tuning Stick with cables from few manufacturers that apply different approaches. To my surprise the effect was the same only varying to the small degree. Most importantly the music become much more lively and presentable. At the end of the day all the attributes of a greater performance matters a little to me if they don't adds to the main reason of high-end audio music reproduction; namely the musical impact and enjoyment. Universal Tuning Stick set the pace that lingered for quite some time. This is for sure an the Akiko product in the line of Tuning Sticks to show it first while demonstrating. 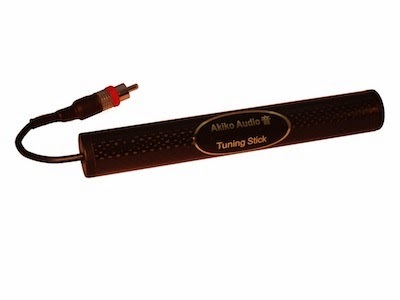 The third product from Akiko Audio AC Tuning Stick deals with the AC power. The logical insertion was into the power strip/distribution ladder. You'll have to dedicate one schuko slot for this, but as you'll read on the effect is worthy of space being taken. AC Tuning Stick performance falls between RCA Tuning Stick and Universal Tuning Stick by the affects it produce. I could easily say that it's impact act within the calming down the "aggressiveness" coming from the main AC outlet. 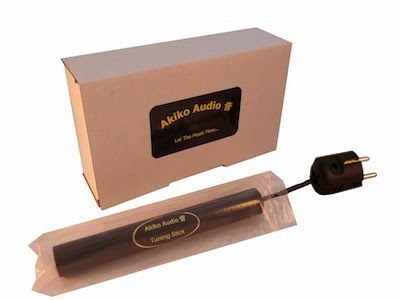 It's not always the easiest effort to transform what we experienced and hear into the something meaningful to read, but Akiko Audio AC Tuning Stick did shift the performance with the noticeable effect. For subtle effects, my critical listening usually starts after 22.00 hours. At best around the midnight. At that time electricity morphs into a complete different beast and often it feels like you're experiencing something new. Either a sole component or the whole system. With Akiko Audio AC Tuning Stick the noticeable betterment was avid even before time when electrical beast is tamed by the absence of all industrial and domestic use. The night hours were not needed. Noticeably the dynamics easiness and more natural laid back presentation was on par with the addition of good power cable. An interesting performance shift and analogy. Akiko Audio AC Tuning Sticks are an interesting additions for fine tuning a high-end audio systems. While their impact might vary, they do bring the performance boost in a stylish package and with without a esoteric price sticker. If you're willing to give your system a bump in the performance with small financial injection then you can choose from company three Tuning Sticks. Each of them was designed for a specific purpose. As written above the most instant affect was clearly from Universal Tuning Stick, but don't let this hold you back. As by nature Audiophiles we're an endless geeks searching for new paths and accessories. 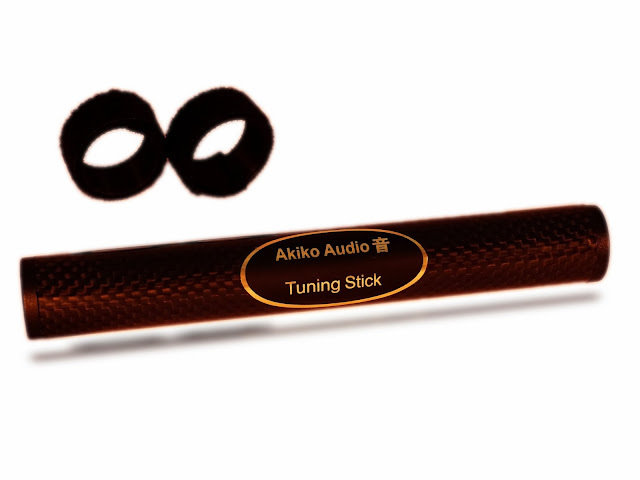 Akiko Audio Tuning Sticks are the interesting high-end tweaks, that actually work and bring the quite some noticeably potency to a audio system.